Sarada is in shock after Sakura is captured by Shin's jutsu. Even Naruto, with his exceptional tracking skills, is unable to locate her. Then Sasuke discovers countless Sharingan embedded in Shin's arm. Following clues gleaned from Shin's arm, they come upon the laboratory of the heinous Hidden Leaf criminal, Orochimaru, who has been conducting research on Forbidden Jutsu. 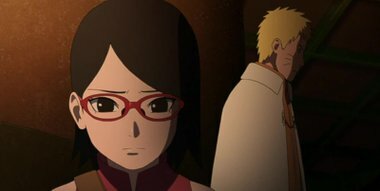 There, Sarada meets her father's former partners Suigetsu Hozuki and Jugo. She then asks Suigetsu to look into who her real mother is.